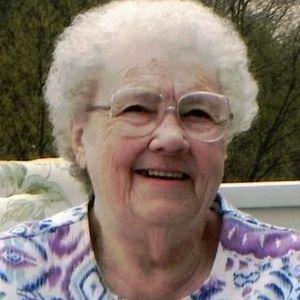 Mary Ellen Clary, age 88 of Sterling, died Wednesday, April 10, 2019 at Rock River Hospice and Home in Sterling. Mary Ellen was born on November 26, 1930 in Nelson, IL, the daughter of Fred and Ruth (Johnson) Black. She married John "Jack" R. Clary on October 1, 1949 in Sterling. He preceded her in death on September 29, 2006. Mary worked at General Electric in Morrison for 24 years. She also worked at the Salvation Army in Sterling for several years and volunteered as a Pink Lady. She enjoyed playing scrabble, doing crosswords, and watching Murder She Wrote and Jeopardy. Mary also loved playing slot machines and going to Las Vegas. Survivors include two daughters, Linda (Robert) Duncan of Rock Falls and Sue (Robert) Hawkins of The Villages, FL; one sister, Jane Pendgraft of Sterling; her sister-in-law, Janice Hines of Milledgeville; two grandchildren, Brian (Jaime) Hawkins and Rebecca (Jermaine) Hawkins-Harris; and seven great grandchildren, Abrianna, Adalynn, Aveyah, Carlee, Jovee, Mackenzie and Alex. She was preceded in death by her husband; her parents; one sister, Lois Dowding; and one granddaughter, Melissa Shaw. Visitation will be Saturday, April 13, 2019 from 11:30 A.M. – 1:30 P.M. at the McDonald Funeral Home in Sterling, 505 1st Avenue. Funeral service will follow at 1:30 P.M. at the funeral home with Pastor Scott Porter officiating. Memorials may be made in her memory to Happy Tails or Rock River Hospice and Home.